Objectives To investigate the rates and causality of adverse event(s) (AE) associated with natural health product (NHP) use, prescription drug use and concurrent NHP-drug use through active surveillance in community pharmacies. Design Cross-sectional study of screened patients. Setting 10 community pharmacies across Alberta and British Columbia, Canada from 14 January to 30 July 2011. Participants The participating pharmacy staff screened consecutive patients, or agents of patients, who were dropping or picking up prescription medications. Primary outcome measures Patients were screened to determine the proportions of them using prescription drugs and/or NHPs, as well as their respective AE rates. 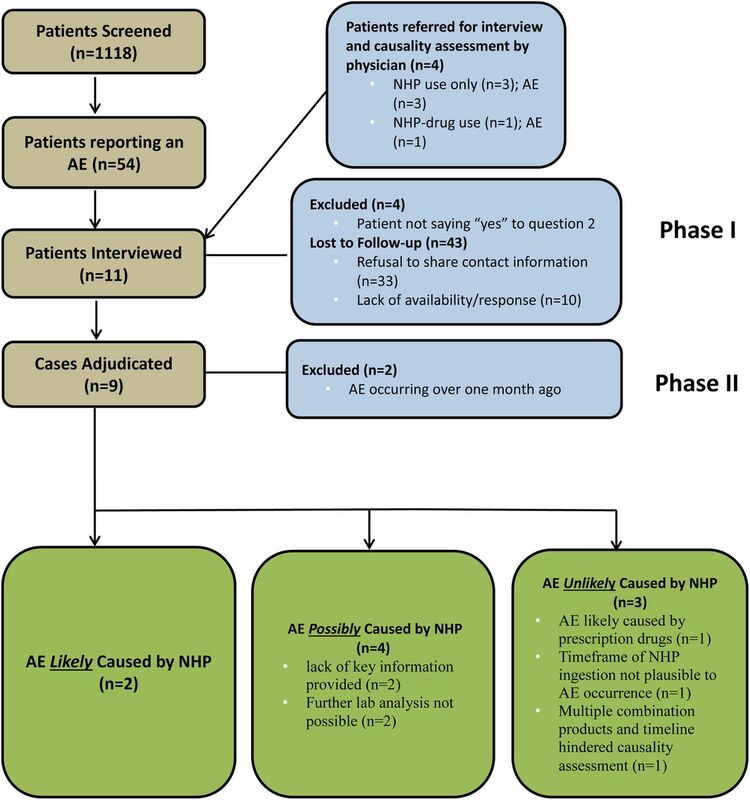 All AEs reported by the screened patients who took a NHP, consented to, and were available for, a detailed telephone interview (14%) were adjudicated fully to assess for causality. Results Over a total of 105 pharmacy weeks and 1118 patients screened, 410 patients reported taking prescription drugs only (36.7%; 95% CI 33.9% to 39.5%), 37 reported taking NHPs only (3.3%; 95% CI 2.4% to 4.5%) and 657 reported taking prescription drugs and NHPs concurrently (58.8%; 95% CI 55.9% to 61.6%). In total, 54 patients reported an AE, representing 1.2% (95% CI 0.51% to 2.9%), 2.7% (95% CI 0.4% to 16.9%) and 7.3% (95% CI 5.6% to 9.6%) of each population, respectively. Compared with patients who reported using prescription drugs, the patients who reported using prescription drugs and NHPs concurrently were 6.4 times more likely to experience an AE (OR; 95% CI 2.52 to 16.17; p<0.001). Combined with data from Ontario, Canada, a national proportion was calculated, which found that 45.4% (95% CI 43.8% to 47.0%) of Canadians who visit community pharmacies take NHPs and prescription drugs concurrently, and of those, 7.4% (95% CI 6.3% to 8.8%) report an AE. Conclusions A substantial proportion of community pharmacy patients use prescription drugs and NHPs concurrently; these patients are at a greater risk of experiencing an AE. Active surveillance provides a means of detecting such AEs and collecting high-quality data on which causality assessment can be based. Active surveillance likely detects adverse events (AEs) due to natural health product (NHP) and prescription drug use at a higher rate than passive surveillance alone, the system that is currently employed by most of the regulatory agencies around the world. Patient interviews allowed for meaningful information to be collected to allow for full causality assessment of an AE; laboratory analysis supported this assessment. The AE rate in patients taking NHPs and prescription drugs concurrently could be compared with those taking prescription drugs alone. The first national data were analysed for this hypothesis across Canada. Data in British Columbia are not consistent with Alberta and Ontario. Risk for possible biases (recall bias, selection bias) due to observational study design. High loss to follow-up rate occurred between the screening and patient interview phases. With increasing NHP use, the concern for consumer safety is also growing.3 ,11 ,12 Typically, NHPs are considered by users to be safe since they are ‘natural’13; however, studies demonstrate some serious toxicities and many possible adverse reactions (ARs) with the use of these products.3 ,11–15 Further, NHP use is higher among patients with chronic medical conditions,16 ,17 where prescription drug use is likely: 58% of cardiovascular patients taking narrow therapeutic index drugs used NHPs and prescription drugs concurrently,18 compared with 39.7% of community pharmacy patients screened in Ontario (ON).19 In patients over 50 years old, 87.4% of those taking NHPs did so in combination with drugs.20 Such patients are at greater risk of drug interactions,21 and therefore ARs. An alternative system, or one that can be used to complement passive surveillance, is increasingly being identified as necessary to mitigate the harms to patients.23 Worldwide active surveillance systems, such as the Sentinel initiative to monitor postmarket risk analysis of health products in the USA and the National Cancer Registry in the UK, are proving to be a successful means of collecting AR data.23 A method of active surveillance that still appears underutilised, however, is the process of building AE detection screening into health professionals’ practice. Pharmacy SONAR was expanded to Alberta (AB) and British Columbia (BC), Canada, to investigate the rate of each prescription drug, NHP and concurrent prescription drug-NHP use, and their respective AE rates, through an active surveillance model in community pharmacies across Western Canada. Our objective was to further assess the feasibility of implementing active surveillance into community pharmacy practices and to calculate a national proportion of patients using prescription drugs and NHPs concurrently, as well as the proportion of those reporting an AE. A two-phase cross-sectional model, as detailed in the ON pilot study,19 was maintained for the purpose of this study. Phase I involved the implementation of active surveillance in community pharmacies and data collection through patient interviews; phase II involved AE causality assessment and laboratory analysis where appropriate. Community pharmacists volunteered to participate. In-store training and all relevant study materials, such as screening logs and patient information packages, were provided to each community pharmacy site. Each site received a copy of an authoritative reference text, Natural Standard27 and a NHP–drug interaction grid28 (created for the pilot study) to support knowledge in this area. Staff were provided follow-up and assistance through remote support (ie, telephone contact), as compared with in-person support by the ON study19 to assess for continued feasibility with less intervention. All consecutive patients bringing prescriptions or collecting medication for themselves (or for a child or other close family member) at a participating pharmacy were included in the study. 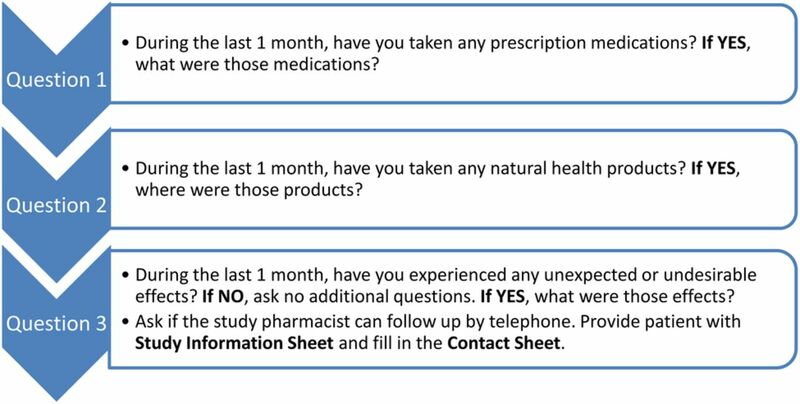 Pharmacists and pharmacy staff asked such patients three questions on the screening log (figure 1). The patients unable to communicate in English were excluded. NHPs were defined in accordance with Health Canada's definition: any vitamin, mineral, herbal remedy, homeopathic medicine, traditional medicine, probiotic, amino acid or fatty acid product.7 One month was chosen as a suitable screening history period to capture AEs following product use to minimise recall bias. If the patient answered yes to questions 2 and 3, they received a study information package. If the patient agreed to participate in follow-up, written consent was obtained by a pharmacy staff member and the study pharmacist was notified. Community pharmacy staff did not assess causality of any reported AE. The study pharmacist (CN) conducted a detailed telephone interview with consenting patients within 1 week of their reporting an AE(s). Verbal consent was obtained at the start of the interview. The interview comprised questions detailing medical conditions, all drug and NHP use and details around the AE(s). The interview form was adapted from the pilot study to include additional details of the NHPs (ie, how they were prepared, when relevant). A copy of the interview form is available from the corresponding author on request. The medical history of 3 months was collected through a telephone interview, allowing for more extensive data to lend knowledge to the overall causality assessment. If deemed necessary, the patient was asked to provide samples of the NHPs and drugs taken at the time of the AE(s) for laboratory analysis in phase II and for consent to report the AE(s) to Health Canada, if this had not already been done. All interviewed cases were summarised and adjudicated by a three-member committee: one clinical NHP expert, one basic science NHP expert and a committee chair (SV) knowledgeable in both areas. The two experts independently assessed each case based on the WHO Causality Assessment Criteria,29 the Naranjo Probability Scale30 and the Horn Drug Interaction Probability Scale.31 In each instance, consensus was reached through discussion. Two laboratories were available for undertaking the following analyses in this study: (1) NHP constituent assessment and (2) adulteration/contamination assessment. The laboratories tested the samples provided by the participants, and if the samples were unavailable, similar products from the same lot or batch were tested. Ten pharmacies across AB (n=7) and BC (n=3) participated in the study. Over a period of 105 pharmacy weeks (14 January to 30 July 2011), 1118 patients were screened. Tables 1 and 2 show proportions of patients screened using NHPs and/or prescription drugs and those reporting AEs, respectively. The results were similar when the responders with incomplete screening data (ie, each of the three questions were not filled in) were included in the denominator of the analysis; therefore, the results are reported including all patients screened. When compared with taking prescription drugs alone, patients taking concurrent NHP-prescription drugs were 6.38 (95% CI 2.52 to 16.17; p<0.001) times more likely to experience an AE. When looking at AB separately, the OR was 4.78 (95% CI 1.88 to 12.16; p<0.001); an OR could not be provided for BC due to having no AE reports in the exposure reference group (prescription drugs only). Table 3 provides ORs for each province, where such analysis was possible. Similarly, data could not be further stratified by pharmacy due to a lack of AE reports in the exposure reference group in some pharmacies. Nearly half (n=17; 34.0%) of the patients reporting an AE, while also taking a NHP, consented to be contacted for a detailed interview, of whom 7 (14.0%) were interviewed. Four patients reporting an AE with NHP use were referred to the study for causality assessment. All four patients were interviewed and underwent phase II of the study; however, they were not included in the phase I analysis since they were not screened at a participating study site. Figure 2 details patient involvement during the two study phases. Flow diagram of phase I and II results. AE, adverse event; NHP, natural health product. Nine of the 11 cases with detailed interviews underwent causality assessment; 2 were not assessed due to AEs occurring beyond the 1-month screening timeframe (figure 2). Two of nine cases (22.2%) were determined to be ‘likely’ due to a NHP, with one case likely due to an interaction between one or more NHPs and a prescription drug. A brief summary of each adjudicated case, as well as patient demographics collected, is described in table 4. Laboratory analysis was available for all cases that warranted it, which was determined on a case-by-case basis. Analyses were performed in three reported cases (3, 4 and 5) to assess contribution to causality assessment; significant findings, or lack thereof, are described in table 4. Implementing active surveillance into community pharmacies markedly improves the detection of AEs reported by patients taking NHPs. The results indicate that adding one or more NHPs to a patient's prescription drug regimen significantly increases the likelihood of reporting an AE. Our study's interview and adjudication process allowed for complete causality assessment of the AEs reported by consenting and interviewed patients, since an AE is not considered an AR until causality is suspected or confirmed, as well as until meaningful, high-quality AR reports are submitted to Health Canada. The screening questions trialled were brief33 and well accepted by pharmacists, allowing full disclosure around NHP use and an opportunity to discuss health outcomes with their patients. Pharmacy SONAR's active surveillance detected 54 AE reports in 1118 patients screened; in comparison, Health Canada received 342 spontaneous AR reports involving NHPs during the same time period from a population of approximately 30 million Canadians.34 It is arguable whether these data are comparable, as by definition, AR reports assume a causal relationship by whomever submits them, while AE requires assessment to determine causality. While reports submitted to Health Canada are labelled ARs, they still undergo independent assessment by the regulatory agency to assess causality. Events identified in Pharmacy SONAR were labelled AEs pending adjudication; however, they were obtained through specific questioning about product exposure. We believe that the designation of ‘AR’ should be reserved until causality assessment has been determined. Our study was able to ascertain AE reports in specific patient subgroups: those taking prescription drugs only, NHPs only and both concurrently. Another strength of our study is the causality assessment that was available for each AE reported; however, in practical terms, it was restricted to only those who consented to, and were available for, an interview. Although scheduling patient interviews was not without challenges, all that were completed provided meaningful information to allow for a full adjudication of the AE. Health Canada could not provide information on how many of their 342 reports involving NHPs were assessed for causality.34 Many important steps need to be taken before a reported AE associated with a product can be deemed causal; unfortunately, data collected through passive surveillance systems are often of insufficient quality to support this process.11 ,23 ,24 ,35 The knowledge gained through laboratory analysis around constituents and toxicology of NHPs associated with AEs collected in our study allowed insight into the causality of the event. Only a fraction of patients visiting participating pharmacies was screened in our study; exact information on the proportion screened is not known since pharmacies consider the denominator (number of patients seen) proprietary. Community pharmacists reported time constraints due to high prescription volumes and numerous corporate demands. We attempted weekly phone calls to improve staff involvement, but limited our support to that which could be accomplished remotely (ie, off-site). Seeking pharmacy participation from the store level rather than the corporate level seemed to improve staff engagement. Ideally, the screening questions tested in this study should be built into pharmacists’ routine practice in order to gain insight into their patients’ health outcomes and monitor health product (drugs and NHPs) safety. Given the Canadian population of 30 million people, the relatively few patients screened in our study do not allow for a definitive conclusion to be drawn; our results are, however, strongly indicative of the potential risks present when combining prescription drug and NHP use. Biases were also possible given the observational study design. Sampling bias may have occurred with respect to whom, or when, pharmacists screened, based on their workload. Recall bias was minimised limiting the screening history timeframe to 1 month, encouraging patients to obtain information from product bottles during the interview and by confirming information from hospitalisation records. The data collected from the pharmacies in BC are not consistent with that of AB, or even ON.19 Even with fewer overall patients screened, the AE rates found in individual pharmacies are much lower than other pharmacies in AB and ON with similar numbers of patients screened. Based on discussion with the pharmacy staff, no clear reasons were provided as to why this may have occurred. It is possible that the number of patients screened at those pharmacies was too few to capture a true AE rate, or there may be important differences in the number of AEs experienced by patients in this population. At the time of screening, pharmacists in BC were reimbursed by the government to conduct medication history interviews with their patients; this may have prevented or resolved AEs occurring in patients visiting these pharmacies. Further screening is needed to determine whether this variation found is a true difference or not. The NHPs listed in table 4 are stated as on the manufacturers’ product packages since this is the information immediately available to someone selling, recommending or purchasing a NHP; typically, manufacturers’ packaging did not include full product specifications, and often even basic details, such as plant species and plant part, were absent. Our study results provide similar data to a recent national Health Canada survey, where 73% of Canadians report taking at least one NHP and 15% experienced an unwanted reaction.1 However, we were able to capture more specific data (ie, how many of those patients were taking a NHP with a prescription drug vs alone) and we identified a markedly higher number of AE reports than Health Canada.1 It can be argued that the type of events reported through spontaneous reporting is already suspected to be causally linked to a health product by the reporter, and would therefore be viewed as an AR instead of an AE. It is possible that Pharmacy SONAR captured a higher number of harms due to screening for all AEs, with or without suspicion of causation. However, it is also possible that the first two questions in the screening process may have prompted a patient to link an event to a health product (asking about product use before asking about an AE). In addition, the pharmacy staff may have selectively recorded certain AEs over others based on their own knowledge or bias around whether a causal link was plausible. A survey conducted by Salvo et al43 in southern Italy found that women aged between 18 and 52 years who reported an adverse drug event (ADE) were significantly more likely to be using alternative or complementary medicine than those who reported no ADE (20.4% and 8.2%, respectively). This survey also collected data on drug use; however, details around how drugs and complementary medicines were taken (alone or in combination) were not described.43 Our study was able to collect such data and, as such, determine whether patients taking both types of products in combination are more likely to experience an AE than those taking drugs alone. It is likely that there exists a continuum between food, or dietary compounds, NHPs and drugs, and clinically relevant interactions exist along this spectrum. Studies in the literature report such interactions44–48 and further research will likely continue in this area. The data collected in our study involved drug use and NHP use; however, further information was collected on dietary intake during the telephone interview, especially when food or beverages were taken at the same time as NHPs and/or drugs, and considered by the adjudication committee when assessing for causality. Health professionals are encouraged to screen for NHP use and AEs associated with NHP and prescription drug during routine patient care. By improving the rates of AE identification and reporting, possible harms can be detected sooner, and even prevented. Our study screening questions are brief, taking approximately 15 seconds per patient to administer.19 Health professional prompting will increase the discussion around NHPs with their patients as well as improve awareness of the therapies their patients are engaged in so as to improve safety and health outcomes. It is also important for clinicians to consider that there is a continuum from food–functional foods–nutraceuticals–NHPs–OTCs–prescription drugs, and they should be vigilant in collecting a complete medical history from patients around all products taken and any dietary modifications made by patients for the purpose of health. The data collected during this study will be populated in a database to allow for health professional and researcher access to NHPs, prescription drugs and combinations that have been used with and without reported AEs, as well as details around specific AEs found. The data collected around which prescription drugs and NHPs were taken with and without reports of harm would be valuable to analyse, and would be important to patient safety in the future. Pharmacy SONAR demonstrates that active surveillance of prescription drug and NHP-related AEs in community pharmacies is feasible and increases the rate of AE detection significantly compared with that of passive surveillance. With methods refined in our pilot study,19 we have been able to determine national estimates for NHP, drug and concurrent NHP-drug use and associated AEs. Of particular note, one of the strongest aspects of this study is its ability to assess each case reported for causality, to include laboratory analysis of products and produce high-quality suspected AR reports for the federal regulatory body (in this case, Health Canada). Future research might include assessing the impact of implementation of active surveillance of NHPs in different healthcare locations, such as hospitals or naturopathic clinics. In addition, it would be valuable to screen patients with chronic medical conditions who may be at higher risk for experiencing AEs. In terms of the study process, methods to improve the number of patients screened and those interviewed after reporting an AE (loss to follow-up) would allow for a more definitive conclusion to be drawn and more data collected in this area. The authors would like to thank Hitesh Bhatt for his assistance in data analysis. Natural Health Products Directorate—Health Canada. Natural Health Product Tracking Survey––2010 Final Report. Ipsos-Reid. March 13 2011. http://epe.lac-bac.gc.ca/100/200/301/pwgsc-tpsgc/por-ef/health/2011/135-09/report.pdf (accessed 30 Mar 2012). Vicki Wood. OTC Market Report 2012: introduction. Canadian Healthcare Network. 2012. http://www.canadianhealthcarenetwork.ca/pharmacists/clinical/otc/otc-market-report-2012-introduction-16126 (accessed 11 Nov 2012).
. Reporting natural health product related adverse drug reactions: is it the pharmacist's responsibility? Int J Pharm Pract 2011;19:383–91.
. Costs of complementary and alternative medicine (CAM) and frequency of visits to CAM practitioners: United States, 2007. Natl Health Stat Report 2009;1–14.
. Complementary and alternative medicine use in Australia: a national population-based survey. J Altern Complement Med 2007;13:643–50.
. Use of topical herbal remedies and cosmetics: a questionnaire-based investigation in dermatology out-patients. J Eur Acad Dermatol Venereol 2009;23:1298–303.
. Food and Drugs Act. Health Canada. 2003. http://gazette.gc.ca/archives/p2/2003/2003-06-18/html/sor-dors196-eng.html (accessed 11 Nov 2012).
. OTC Market Report 2009: more often, self-care means going natural. Canadian Healthcare Network. 1 April 2009. http://www.canadianhealthcarenetwork.ca/pharmacists/clinical/otc/otc-market-report-2009-more-often-self-care-means-going-natural-1055 (accessed 11 Nov 2012).
. Community identification of natural health product drug interactions. Ann Pharmacother 2007;41:1124–9.
. 38% of doctors now suggest natural health products: survey. Canadian Healthcare Network. May 18, 2011. http://www.canadianhealthcarenetwork.ca/pharmacists/clinical/health-index-therapeutics/alternative-medicine/38-of-doctors-now-suggest-natural-health-products-survey-11135 (accessed 11 Nov 2012).
. Pharmacovigilance of herbal medicine. J Ethnopharmacol 2012;140:513–18.
. Pharmacovigilance of herbal medicines: a UK perspective. Drug Saf 2003;26:829–51.
. Adverse event reporting for herbal medicines: a result of market forces. Healthc Policy 2009;4:77–90.
. Contamination and adulteration of herbal medicinal products (HMPs): an overview of systematic reviews. Eur J Clin Pharmacol 2013;69:295–307.
. Hepatotoxic slimming aids and other herbal hepatotoxins. J Gastroenterol Hepatol 2008;23:366–73.
. Use of herbal medicine in primary care patients with mood and anxiety disorders. Psychosomatics 2005;46:117–22.
. Use of complementary and alternative medicine by persons with arthritis: results of the National Health Interview Survey. Arthritis Rheum 2005;53:748–55.
. Use of complementary and alternative medical therapies in patients with cardiovascular disease. Am Heart J 2003;145:806–12.
. Study of natural health product adverse reactions (SONAR): active surveillance of adverse events following concurrent natural health product and prescription drug use in community pharmacies. PLoS ONE 2012;7:e45196.
. A national census of medicines use: a 24-hour snapshot of Australians aged 50 years and older. Med J Aust 2012;196:50–3.
. Medication safety issues in older Australians. Results from a national medicines census. Joint ASCEPT-APSA conference 2012, Sydney Convention and Exhibition Centre, Sydney, Australia, December 2–5, 2012. Australian Society of Clinical and Experimental Pharmacology and Therapeutics—Australian Pharmaceutical Science Association.
. The World Medicines Situation 2011: pharmacovigilance and safety of medicines. World Health Organization 2011. http://apps.who.int/medicinedocs/documents/s18771en/s18771en.pdf (accessed 11 Nov 2012).
. Keeping an eye on prescription drugs, keeping Canadians safe: a commissioned discussion paper. Health Council of Canada 2010 http://publications.gc.ca/collections/collection_2011/ccs-hcc/H174–21–2010-eng.pdf (accessed 30 Mar 2012). World Health Organization (WHO). Note for guidance on clinical safety data management: definitions and standards for expedited reporting. Geneva: Author; 1995. CPMP/ICH.377/95.
. Pharmacists’ role in reporting adverse drug reactions in an international perspective. Pharmacoepidemiol Drug Saf 2004;13:457–64.
. Buyer beware? Does the information provided with herbal products available over the counter enable safe use? BMC Med 2011;9:94.
. eds. Natural standard herb & supplement reference: evidence-based clinical reviews. St Louis, MO: Elsevier Mosby, 2005.
. A tool for rapid identification of potential herbal medicine-drug interactions. Can Pharm J 2009;142:224–7. WHO adverse drug event causality assessment criteria, Uppsala drug monitoring centre. http://www.who-umc.org/DynPage.aspx?id=22682. (accessed 2012 Apr 6).
. A method for estimating the probability of adverse drug reactions. Clin Pharmacol Ther 1981;30:239–45.
. Proposal for a new tool to evaluate drug interaction cases. Ann Pharmacother 2007;41:674–80. Stata data analysis and statistical software version 12.0. StataCorp LP. Texas, USA.
. Pharmacists’ participation in research: a case of trying to find the time. Int J Pharm Pract 2010;18:377–83. Marketed Health Products Directorate. Memo. 30 May 2012.
. Under-reporting of adverse drug reactions: a systematic review. Drug Saf 2006;29:385–96.
. Multiple drug exposure as a risk factor for the seriousness of adverse drug reactions. J Nurs Manag 2011;19:395–9. Canadian Pharmacists Association. Expanding the role of pharmacists. http://pharmacists-ca.inf.ca/content/consumer_patient/resource_centre/working/pdf/Expanding_the_Role_of_Pharmacists_Mar07.pdf (accessed 30 Oct 2012).
. Use of complementary and alternative medicine in a general pediatric clinic. Pediatrics 2007;120:e138–41.
. Potential vitamin-drug interactions in children at a paediatric emergency department. Paediatr Drugs 2009;11:251–7. Pharmanet. Ministry of Health. Government of British Columbia. http://www.health.gov.bc.ca/pharmacare/pharmanet/netindex.html (accessed 30 Oct 2012).
. Active monitoring of adverse drug reactions in children. Lancet 2000;355:1613–14.
. Educational intervention to improve physician reporting of adverse drug reactions (ADRs) in a primary care setting in complementary and alternative medicine. BMC Public Health 2009;9:274.
. Attitudes and opinion about adverse drug events of women living in a city of south Italy. Pharmacology 2013;91:173–7.
. Food and therapeutic product interactions—a therapeutic perspective. J Pharm Pharm Sci 2009;12:367–77.
. In vitro inhibitory effect of West African medicinal and food plants on human cytochrome P450 3A subfamily. J Ethnopharmacol 2010;128:390–4.
. SONAR group. Polypharmacy, multiple natural health products and hepatotoxicity. CMAJ 2011;183:E1085–9.
. The effect of β-carotene supplementation on the pharmacokinetics of nelfinavir and its active metabolite M8 in HIV-1-infected patients. Molecules 2012;17:688–702.
. Comparative study of hops-containing products on human cytochrome P450-mediated metabolism. J Agric Food Chem 2011;59:5159–63.
. How well do pharmacists know their patients? A case report highlighting natural health product disclosure. Can Pharm J 2013;146:202–9. Contributors CN initiated the project, responsible for design and methodology, interviewed the patient presented in case report and wrote manuscript (including final draft). RTT participated in original conception and design of the project, case adjudication, supervised project and reviewed all drafts of manuscript. HB supervised project, participated in original conception and design of the project and reviewed all drafts of manuscript. JB, MAW and TLC participated in original conception and design of the project, case adjudication and reviewed final draft of manuscript. JTA, DL, GC and BCF participated in original conception and design of the project, case adjudication, laboratory analysis and reviewed final draft of manuscript. MM participated in original conception and design of the project, provided support from Health Canada and reviewed final draft of manuscript. RJR participated in original conception and design of the project, provided graduate student statistical support and reviewed final draft of manuscript. SV is the primary supervisor of project, participated in original conception and design of the project, and reviewed all drafts of manuscript. Funding This work was funded by the Canadian Institute of Health Research, Health Canada, Canadian Patient Safety Institute. Competing interests SV receives salary support from the Canadian Institute of Health Research and holds an Alberta Heritage Foundation for Medical Research Health Scholar Award. RJR receives salary support by Alberta Innovates—Health Solutions (Edmonton, Canada) as a Health Scholar. Ethics approval Human Research and Ethics Board, University of Alberta. Data sharing statement Researchers can access the data collected in this study through the corresponding author.